RDs are uniquely positioned to assist clients with understanding food labels and influencing them to make healthful nutrition choices. This continuing education article will help explain what information is available on food labels, the laws regulating these labels, the oversight process to ensure proper labeling, the limitations of such oversight, and recommendations for improving the labeling system so RDs can assist patients in making positive, healthful food choices in the marketplace. These labeling regulations are clearly more pertinent to a food manufacturer than a consumer. However, the detail in which food manufacturing is regulated illustrates the importance of and need for legal standards in the food industry. Title 21 isn’t limited to regulations on food manufacturing; it also regulates labeling that directly affects consumers in their perception of a food’s content and a product’s relative health value. With a few exceptions (relating mainly to small business exemptions and single food products), nutrition information must be provided on all food products. “Serving” or “serving size” refers to an amount of food customarily consumed per eating occasion by anyone 4 years of age or older. Further, the amount must reflect a common household measure (eg, 1/2 cup or 2 TB) that’s appropriate for the food. For food specifically formulated for infants or toddlers, “serving size” refers to an amount of food typically consumed per eating occasion by infants up to 12 months of age or by children aged 1 to 3. Some general exemptions from these labeling requirements exist for packaged single-ingredient products that consist of fish or game meat, foods in small packages with a total surface area for a label of less than 12 square inches, shell eggs packaged in a carton with a top lid (in this case, the nutrition information may appear beneath the carton lid), and food products sold in bulk.15 Small businesses may file a notice with the FDA if production doesn’t exceed 100,000 units sold per year, and need not file if production doesn’t exceed 10,000 units. The FDA urges but doesn’t require raw fruit, vegetable, and fish producers to voluntarily provide nutrition labeling for their products unless those raw fruits, vegetables, and fish are on the FDA’s most frequently consumed list, which includes the 20 most commonly consumed varieties of fruits, vegetables, and fish, respectively.16 For those common varieties, the guidelines apply. The FDA, an agency of the US Department of Health and Human Services, is a federal public health consumer protection agency that regulates most food products (other than meat and poultry), human and animal drugs, medical devices, cosmetics, and animal feed. The agency originated in 1862 from a single USDA chemist and now employs more than 11,000 people, including chemists, pharmacologists, physicians, microbiologists, veterinarians, lawyers, and pharmacists. The organization consists of the Office of the Commissioner, the Office of Medical Products and Tobacco, the Office of Global Regulatory Operations and Policy, the Office of Operations, and the Office of Foods. Within the Office of Foods is the Center for Food Safety and Applied Nutrition (CFSAN). The CFSAN is responsible for, among other things, ensuring that the nation’s food supply is safe, sanitary, and honestly labeled. It oversees food additives, food ingredients developed through biotechnology, seafood, juice, foodborne contaminants, dietary supplements, infant formulas, medical foods, food labeling, and international food standards. A state may bring an action for civil enforcement of an FDA regulation by filing a letter of notification with the FDA.25 Citizens and citizen groups also may urge the FDA to investigate a potential labeling issue. The FDA will prioritize the complaint in cases where significant injury or illness allegedly resulted from the potential labeling violation. The FDA doesn’t seem to have a strong and effective system to ensure that most, if not all, food labels comply with the law. The agency’s limitations include infrequent investigations and disciplinary action, failure to properly document consumer complaints, and inaccurate reporting within the agency and to the public. Between 2001 and 2007, the number of food companies under the FDA’s jurisdiction increased from approximately 51,000 to 65,000. The number of label inspections made by the FDA during that time, however, decreased.26 During a five-year span starting in 2002, the FDA issued only 463 warning letters to companies with serious violations that included labeling violations, and a little more than one-half of these warning letters were related to the labeling of dietary supplements.26 The time between the day officials identify the violation and the day the FDA issues a warning letter is about four months.26 This relatively significant time lag is especially concerning when the labeling violation can be causally related to allergic reactions or other adverse physiologic responses. The amount of funding allotted to the FDA to handle food labeling claims has decreased, resulting in a reduced number of inspectors and enforcement employees.26 Thus, the above limitations, at least in part, are likely due to the lack of resources allotted to the FDA to enforce food labeling laws. Despite the apparent limitations of the FDA’s capacity to enforce food labeling infractions, recent enforcement activity has drawn the attention of food manufacturers. In early 2010, the FDA issued 17 warning letters regarding potential labeling violations to several large food manufacturers. For example, the warning letter sent to Dreyers Grand Ice Cream, Inc criticizing the company for printing statements on its product labels saying its products were free of trans fats but failing to advise the consumer to check the nutrition information for fat and saturated fat content. The FDA noted that clarification statements regarding total and saturated fat are required on foods that make nutrient claims such as “trans fat free” and that contain more than 13 g of total fat or 4 g of saturated fat per labeled serving. The POM Wonderful labeling issue provides perhaps the most widely-noted recent example of an FDA written warning. On February 23, 2010, the FDA issued a warning letter to POM Wonderful stating that its 100% pomegranate juice was improperly labeled as a food, not a drug, in that its website, as promoted on the juice’s label, contains claims of treatment, mitigation, and disease prevention (eg “[In atherosclerosis] patients who consumed 8 ounces of POM Wonderful 100% Pomegranate Juice daily for a one-year period, [they] experienced a 30% reduction in intima-media thickness of the carotid artery versus a 9% increase for the placebo group”).27 Because the label content implied that the product had druglike features, the product was considered a drug under Title 21 and failed to comply with regulations concerning the labeling of drugs. POM Wonderful didn’t heed the FDA’s warning, spurring a well-publicized lawsuit involving the Federal Trade Commission (FTC). POM Wonderful claimed the FTC didn’t have the authority to require FDA approval before POM makes health-related claims, and the FTC argued that POM Wonderful was engaging in false and misleading advertising.28 As of March 2012, this case hadn’t been resolved. While it’s unclear whether the FDA will continue to step up enforcement actions, its recent activity may indicate a reaction to the proliferation of food labeling information. Although the recent FDA actions may signal a trend of tighter enforcement, the limitations of the current oversight system discussed above increase the likelihood of potential consumer injuries. A consumer may buy a product under the false, but reasonable, impression that it leads to some health benefit. He or she may suffer monetarily (spending money that he or she wouldn’t have spent had the labeling been accurate) or physically (becoming ill due to ingesting an allergen that wasn’t clearly listed). • Clearer whole grains labeling: Such labeling would enable consumers to have a clearer understanding of the actual amount of whole grains in a food. The need for this marking became clear after studies revealed that consumers can’t accurately identify which foods are primarily whole grains. In a related note, the Whole Grains Council, a nonprofit consumer group whose mission is to increase whole grain consumption, has created a Whole Grain Stamp. It identifies products with at least a one-half serving of whole grains. A “100%” banner may be placed on the stamp where all of the grain in the product is whole grain. • Trans fat-free labeling: The goal of this endeavor is for the FDA to prohibit foods with a substantial amount of saturated fats from being labeled as “trans fat free.” The trans fat-free label entices consumers to buy the food item thinking it may be a low-fat food. But the food may be high in saturated fat, which raises LDL cholesterol levels in the blood and increases the risk of heart disease. • Total nutrition information for items commonly consumed in one sitting: Consumers are often misled by labels that give calorie, fat, and carbohydrate figures for a partial amount of the food item when such item is commonly consumed all at once. For example, a 20-oz bottle of fruit drink may list the nutritional information for a serving size of one-half of the bottle, listing that the bottle contains two servings. The average consumer, however, typically drinks the entire bottle at once. • Clarification of “natural”: The FDA hasn’t established an official definition of the word natural, although the term, rampantly used in the marketplace, likely leads consumers to believe that a product is the result of minimal to no processing. These action items may significantly assist consumers in their evaluation of products, but it’s unclear where these items fall on the FDA’s list of priorities considering its already-taxed system and funding restrictions. Patient education is critically important because patients would benefit from understanding the above-mentioned limitations on food labeling when making their own eating and nutrition decisions. Nothing replaces a good one-on-one session between a patient and an RD. To the extent that an RD wants his or her patient to be able to rely on helpful resources outside the provider-patient relationship, there are numerous resources that may assist in counseling a consumer on how to read a food label. One of the more comprehensive and user-friendly resources is the Mayo Clinic’s Interactive Guide to Food Labels.34 This guide is a free online tool that any consumer can access via the Internet. A user is shown a Nutrition Label and can simply move the mouse pointer over a nutrient on the label to see what the Nutrition Label means. The Mayo Clinic website also contains links from that page to information about health and lifestyle. Obesity and chronic illness are widespread problems in America due, in part, to poor diet and lifestyle choices. If government’s effective regulation of food labels can assist consumers in making sense of often confusing nutrition messages and understanding nutrition information about the foods they eat, then continued improvements in labeling regulations can only benefit consumers and the RDs who teach and counsel them. — Dara Lovitz, Esq, is the author of Muzzling a Movement: The Effects of Anti-Terrorism Law, Money, and Politics on Animal Activism who has written numerous articles and book chapters on law and policy. 1. Discuss with patients the different types of regulated labeling statements contained on food packaging. 2. Analyze the regulation of and limitations to manufacturers’ use of common labeling statements. 3. Identify the US government agencies responsible for regulating food labels. 4. Assess the regulating agencies’ limitations in controlling labeling statements presented to consumers. 5. Compare suggested methods of improving consumer comprehension of food products through labeling. A. the nutrition laws of each individual state. C. the US Agricultural Act. D. Title 21 of the Code of Federal Regulations. A. 2 years of age or older. B. 4 years of age or older. C. 10 years of age or older. D. 18 years of age or older. A. food prepared at an organic facility. B. all raw fruits, vegetables, and fish. C. some raw fruits, vegetables, and fish. D. foods that are naturally fat free. A. fewer than 5 kcal per serving. B. fewer than 8 kcal per serving. C. fewer than 10 kcal per serving. D. fewer than 12 kcal per serving. B. image of a person running through a race finish line. A. the Federal Trade Commission. B. the US Department of Health and Human Services. C. the Center for Food Safety. A. the Nutrition Labeling and Education Act. B. the Food Labeling and Resource Law. C. the President’s Referendum of Food Safety. D. the Government Authority Statute. A. write a letter to the manufacturer warning it to take measures to correct the error. B. order a seizure of the food items to remove them from the marketplace. C. request that the company remove the food item from the marketplace. 9. From 2002 to 2007, the FDA issued how many warning letters to food manufacturers for labeling violations? 1. Quaker lower sugar instant oatmeal: Maple & Brown Sugar. Quaker Oats website. http://www.quakeroats.com/products/oatmeal/lower-sugar/maple-and-brown-sugar.aspx. Accessed March 8, 2012. 2. Britten P, Haven J, Davis C. Consumer research for development of educational messages for the MyPyramid Food Guidance System. J Nutr Educ Behav. 2006;38(6 Suppl):S108-S123. 3. Code of Federal Regulations: Food; exemptions from labeling, 21 CFR Sect 101.100 (2011). 4. Code of Federal Regulations: Frozen cherry pie, 21 CFR Sect 152.126(b)(1)(ii) (2011). 5. Code of Federal Regulations: Refrigeration of shell eggs held for retail distribution, 21 CFR Sect 115.50 (2011). 6. Code of Federal Regulations: Cultured milk, 21 CFR Sect 131.112 (2011). 7. Code of Federal Regulations: Definitions, 21 CFR Sect 129.3(a) (2011). 8. Code of Federal Regulations: Dry curd cottage cheese, 21 CFR Sect 133.129 (2011). 9. Code of Federal Regulations: Enriched bread, rolls, and buns, 21 CFR Sect 136.115(a)(4) (2011). 10. Code of Federal Regulations: Canned fruit cocktail, 21 CFR Sect 145.135(a)(2)(iv) (2011). 11. Code of Federal Regulations: Semolina, 21 CFR Sect 137.320 (2011). 12. Code of Federal Regulations: Margarine, 21 CFR Sect 166.110(a)(1) (2002). 13. Code of Federal Regulations: Mayonnaise, 21 CFR Sect 169.140 (2011). 15. Code of Federal Regulations: Nutrition labeling of food, 21 CFR Sect 101.9 (2011). 16. Code of Federal Regulations: What are the 20 most frequently consumed raw fruits, vegetables, and fish in the United States?, 21 CFR Sect 101.44 (2011). 17. Code of Federal Regulations: Nutrient content claims for the calorie content of foods, 21 CFR Sect 101.60 (2011). 18. Code of Federal Regulations: Nutrient content claims for “light” or “lite,” 21 CFR Sect 101.56 (2011). 19. Code of Federal Regulations: Health claim: general requirements, 21 CFR Sect 101.14 (2011). 20. Code of Federal Regulations: Petitions for health claims, 21 CFR Sect 101.70 (2011). 21. Federal Food Safety Oversight: Food Safety Working Group Is a Positive First Step but Governmentwide Planning Is Needed to Address Fragmentation. Washington, DC: US Government Accountability Office; March 2011. GAO-11-289. 22. Office of Foods: overview and mission. US Food and Drug Administration website. http://www.fda.gov/AboutFDA/CentersOffices/OfficeofFoods/ucm196720.htm. Last updated October 19, 2011. Accessed February 9, 2012. 23. Code of Federal Regulation: Enforcement policy, 21 CFR Part 7 (2011). 24. Code of Federal Regulation: Recall policy, 21 CFR Sect 7.40 (2011). 25. Code of Federal Regulation: State enforcement of federal regulations, 21 CFR Sect 100.2 (2011). 26. Food Labeling: FDA Needs to Better Leverage Resources, Improve Oversight, and Effectively Use Available Data to Help Consumers Select Healthy Food. Washington, DC: US Government Accountability Office; October 2008. GAO-08-597. 27. POM Wonderful warning letter. US Food and Drug Administration website. http://www.fda.gov/ICECI/EnforcementActions/WarningLetters/ucm202785.htm. February 23, 2010. Accessed March 8, 2012. 28. FTC v. POM Wonderful: an update. FDA Law Blog website. http://www.fdalawblog.net/fda_law_blog_hyman_phelps/2012/03/ftc-v-pom-wonderful-an-update.html. March 5, 2012. Accessed March 8, 2012. 29. Cowburn G, Stockley L. Consumer understanding and use of nutrition labeling: a systematic review. Public Health Nutr. 2005;8(1):21-28. 30. Front-of-package nutrition rating systems and symbols: promoting healthier choices. Institute of Medicine website. http://www.iom.edu/~/media/Files/Report Files/2011/Front-of-Package-Nutrition-Rating-Systems-and-Symbols-Promoting-Healthier-Choices/frontofpackagereportbriefFINAL.pdf. October 2011. Accessed March 8, 2012. 31. Scott-Thomas C. FDA offers support in industry roll-out of Facts Up Front labeling. Food-Navigator-USA website. http://www.foodnavigator-usa.com/Regulation/FDA-offers-support-in-industry-roll-out-of-Facts-Up-Front-labeling. February 24, 2012. Accessed March 8, 2012. 32. Kux L. Food labeling: gluten-free labeling of foods; reopening of comment period. Federal Register. 2011;76(149):46671-46677. 33. MacDonald E. FDA moves to clarify meaning of “gluten-free.” Consumer Reports website. 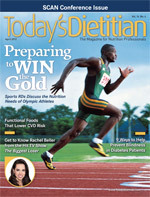 August 8, 2011. http://news.consumerreports.org/health/2011/08/fda-moves-to-clarify-meaning-of-gluten-free.html. Accessed February 9, 2012. 34. Nutrition facts: an interactive guide to food labels. Mayo Clinic website. January 5, 2010.
http://www.mayoclinic.com/health/nutrition-facts/NU00293. Accessed February 9, 2012.